Hello everyone. This is my first Farm Fresh Friday as at DT member! So excited. Hope you all play along too. The theme for FFF this week hosted by the lovely Lysa is.... CLEAN & SIMPLE! Here is my card. I used the girl image from The Greeting Farm set - Later Sk8er and again used the no lines colouring technique. 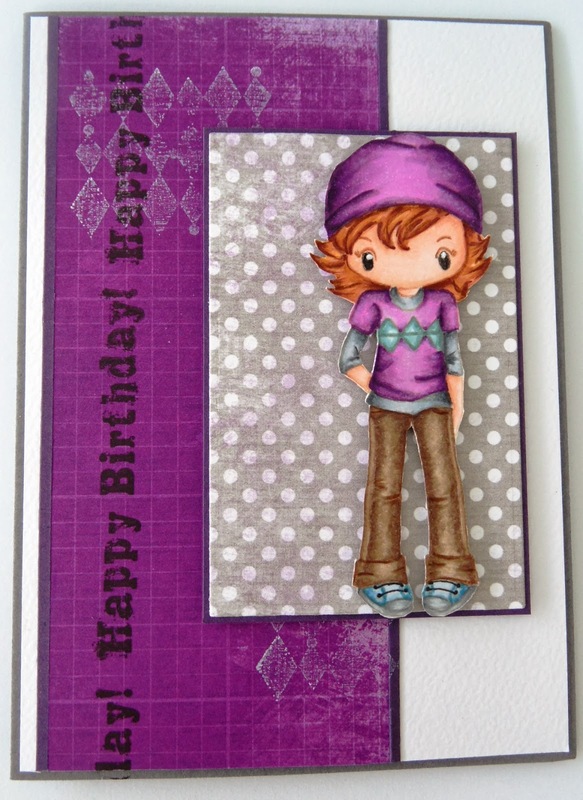 I then teamed her up with some Bo Bunny paper in my favourite colour ... PURPLE! lol The sentiment is from a Stampin' Up set - Grunge Rock. Here is a close up of the image. I actually coloured this in awhile ago and she has been sitting cut out on my desk begging to be put on a card. So this was the perfect opportunity. Be sure to visit The Greeting Farm blog to see some beautiful creations from the Design Team, and to see how to play along with this week's challenge. Wow! Awesome job with the no lines. You used two of my all time favorite sets! - love, love, love l8r sk8r and grunge rock! fab job.